Wood may be a good alternative to the high cost fuels such as fuel oil, propane or electricity for heating your home. It is a renewable fuel, widely available in many regions of Alaska and may save you some money. Wood heat can be a primary source of heat for your home, or a supplement to another system, or perhaps you just want it around for the ambiance. However, wood heating is not for everyone and there are many options and new technologies, so be sure to do your research and seek out good advice. The U.S. EPA first issued emission requirements for residential wood heaters in 1988. Since then, wood burning technology has improved considerably, reducing emissions and increasing the range of wood heaters that are more efficient and less polluting. Based on this improved technology, in February 2015, EPA issued new standards that will result in significantly cleaner burning and more efficient residential wood heaters. In addition to strengthening the standards for traditional wood stoves and fireplace inserts, these new standards also address previously uncertified heaters including indoor and outdoor wood fired boilers (hydronic heaters), indoor wood burning forced air furnaces and "single burn rate stove". Proper installation of any wood heating system is critical to the safe and efficient operation of that system. Follow all manufacturer's instructions to ensure that the air flow needs of your system are met. 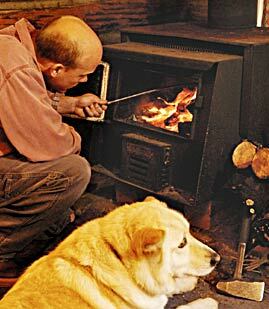 Wood Stoves are space heaters that heat the area directly around them. They are usually made of cast iron, steel or stone. Modern wood stove designs include catalytic and non-catalytic stoves. Fireplaces are either built by a mason on site, or engineered and pre-frabricated prior to installation. Most fireplaces are not used as a primary source of heat because of their low efficiency and heat generation. Their emissions are not regulated by EPA. Fireplace Retrofits are devices that are installed into an existing wood burning fireplace, installed most often to reduce wood smoke from existing fireplaces. Fireplace Inserts are similar in function and performance to free-standing wood stoves, but are designed to be installed within the firebox of an existing fireplace. Pellet Stoves often look like traditional wood stoves, but burn a compressed wood product make of ground, dried wood – pellets. Learn more about Pellet Stoves. Hydronic Heaters use heat from burning wood to warm water that is circulated through pipes to baseboard radiators, radiant floor systems or to heat exchangers that convert the heat to a forced air system. Boiler systems can be located inside your home, or in small sheds nearby. Wood-burning forced air furnaces, also known as wood-burning warm air furnaces, use a large firebox to burn wood, Heat from the furnace, which is usually located indoors, is distributed through the house using a blower or forced air system. These were previously unregulated by EPA.